Welcome to Dikshant International School. From a modest beginning in 2007, Dikshant International School has now grown into a full-fledged school with integrated curriculum. The guiding philosophy of the School, throughout, has been creation of knowledge. The objectives of imparting education, combined with creation, dissemination, and application of knowledge, are being met in an integrated form, to create a synergetic impact. The School fosters and nurtures leaders capable of making difference in the world. It inculcates human values and professional ethics in the students, which help them make decisions and create path that are good not only for them, but also are good for the society, for the nation, and for the world as whole. To fulfil its mission in new and powerful ways, each member of Dikshant International School strives to achieve excellence in education, by making continuous improvements in curricula and pedagogical tools. The education offered by the School subjects the students to an overall transformation, training them to be better human beings. The rigorous syllabi not only instil, in them, a passion for knowledge but also attempt to teach them how to apply that knowledge to real-life situations. The curricula lay emphasis on well-rounded personality development of the students and also in inculcating the values of teamwork and integrity in them. The diversity in Dikshant’s curriculum is complemented by a breadth of activities outside the classroom. Every student finds exhaustive opportunities to participate in and contribute to a variety of co-curricular and extra-curricular activities. A great library, computing, and other educational facilities aid and enrich the process of learning. Children with tender and receptive minds are eager and natural learners. They are quick to observe and absorb all around them. We at Dikshant International School endeavour to optimize their creative and adventurous spirit by providing them all possible avenues of creativity, adventure and sports activities. They being free spirits, we encourage their imagination to spread wings and not restrict their thoughts. 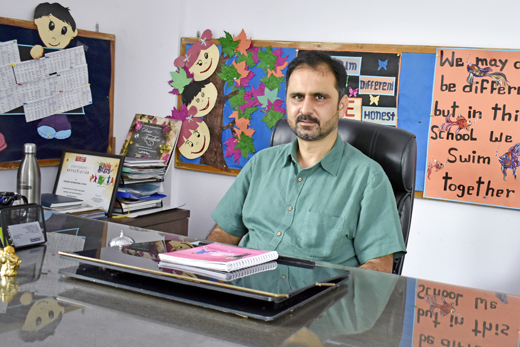 This truly international school, that offers Classes Pre-Nursery to IV, stands tall on the foundation of an excellent, committed and deeply knowledgeable faculty, innovative and unique pedagogical tools and an eclectic and diverse student community that has a burning desire to make new paths of its own. The Dikshant faculty is made up of a group of dedicated professionals who are firstly passionate about teaching children, and secondly, are passionate about teaching their individual subject content and specialty areas. The faculty is a cohesive group which utilizes one another’s gifts and talents to target the needs of every student in their classroom. The Dikshant faculty works closely with families to create a successful educational experience. Although teachers play a key role, parents are also expected to contribute to the students' learning experience at Dikshant. No one can replace their knowledge. Teachers, parents and students work as a team. In combining both home and school knowledge a unique support system for every child is designed so that each student finds a consistent link between school and home. Effective communication is one of the ways in which this happens. Due to our small school setting at the outset, teachers and parents have an opportunity to interact frequently. Globalisation is turning our world into a village. Technology has propelled and fuelled this change on all levels. People of all ethnicities, faiths, cultures, languages, and backgrounds are constantly encountering one another. Economic and political systems are now global in nature. We believe that global education is the key to continued success for every child. Global education is about the internal transformation of the child. We combine the best of traditional and modern systems. Our unique content and process of education equip students to be global-minded, caring, and successful individuals. At Dikshant International School, education is about more than mastering reading, writing, and mathematics. It is about exploring knowledge with an inquisitive attitude, developing capacity for service in the community, learning to make ethical choices, and excelling in extracurricular activities. From the day of its inception, Dikshant International School nurtured a dream to become a leading School with a global vision. Today, with the big strides the school has taken, its dream will soon become a reality. I am sure that, as Dikshant is the first school to offer DigiClasses in Haldwani, it will serve as an academic lighthouse in Haldwani and beyond. I welcome you to explore the wealth of opportunities at Dikshant International School. For those of you who are already a part of our family, thank you for sharing your child with us.